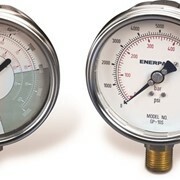 Series 7 professional digital force gauges are designed with a number of sophisticated features for the most demanding tension and compression measurement applications, up to 500 lbF (2500 N). Series 7 professional digital force gauges are designed with a number of sophisticated features for the most demanding tension and compression measurement applications, up to 500 lbF (2500 N). 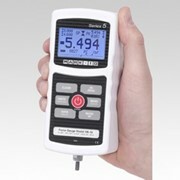 The gauges feature ±0.1% accuracy and a blazingly fast sampling rate of 14,000 Hz, producing reliable results for extremely quick-action tests. 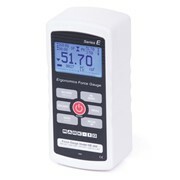 Series 7 gauges include all the functions of Series 5 gauges, with several additional features, including high speed continuous data capture and storage, with memory for up to 5,000 readings, at an acquisition rate of up to 14,000 Hz. 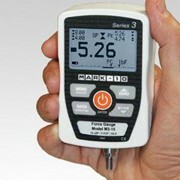 The gauges also feature programmable footswitch sequencing, break detection, and 1st / 2nd peak detection. 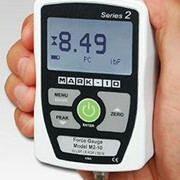 Series 7 includes a coefficient of friction unit of measurement and user-defined unit of measurement. 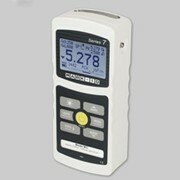 For productivity enhancement, the gauges also feature automatic data output, data storage, and zeroing functions upon the completion of break detection, averaging, external trigger, and 1st / 2nd peak detection. 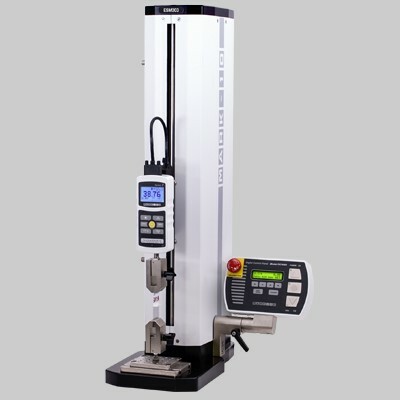 Series 7 force gauges are directly compatible with Mark-10 test stands, including the ESM303, to permit functions such as break testing, tensile testing, compression testing, dynamic load holding, PC control capability, and many other applications. 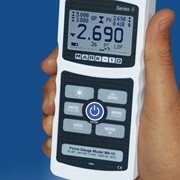 The gauges include MESUR™ Lite data acquisition software. MESUR™ Lite tabulates continuous or single point data. One-click export to Excel allows for further data manipulation. Series 7 can capture and store up to 5,000 continuous data points at a rate of up to 14,000 readings per second. 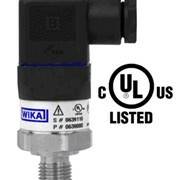 This unique function is ideal for capturing switch activation forces, sharp breaks, and other short-duration applications. Configurable start and stop triggers are provided. The data acquisition rate is variable and can be slowed to also capture longer events, such as structure relaxation, material expansion, and others. 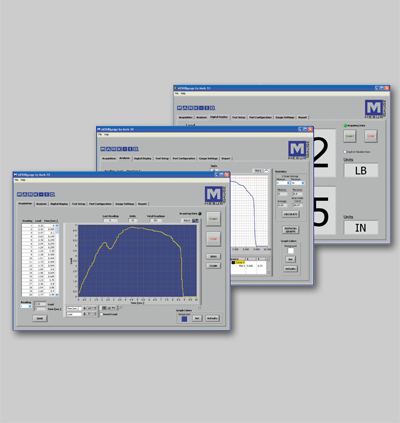 Data from the storage buffer can be exported to data collection software such as MESUR™gauge for further analysis and graphing. 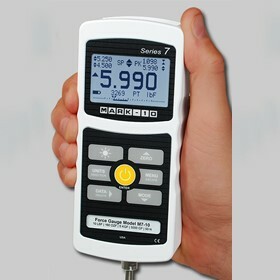 Using a Series 7 gauge could replace cumbersome and expensive data acquisition hardware and software. Integrate your footswitch / automation system with a Series 7 gauge to improve testing ergonomics and efficiency; no need for multiple key presses. Up to three steps may be programmed for a single footswitch activation. Select from several commands, including request peak reading, zero the display, save to memory, and others. Time delays can be inserted between each step. Automatically save the peak reading to memory. Transmit the peak reading via USB, RS-232, or Mitutoyo output. Zero the display. Toggle an I/O pin, for example to stop movement of an ESM303 test stand. Sample break detection (also applicable to samples which slip, click, or otherwise reach a peak, then fall). Completion of an averaging sequence. External trigger (ex. switch activation). 1st / 2nd peak capture (ex. tensile testing). To measure the torque produced by pressing on a lever in a mechanical assembly, configure the multiplier based on the length of the lever, thereby converting a unit such as N into Ncm. To measure the pressure produced by a circular compression plate on a foam sample, configure the multiplier based on the area of the plate, thereby converting a unit such as lbF into psi. Power: AC or rechargeable battery. Multi-step low battery indicator is displayed, gauge shuts off automatically when power is too low. Outputs: USB / RS-232: Configurable up to 115,200 baud. 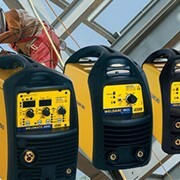 Automatic output available up to 250 Hz. 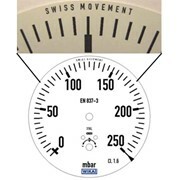 Includes Gauge Control Language 2 for full computer control. Mitutoyo (Digimatic): Serial BCD suitable for all Mitutoyo SPC-compatible devices. 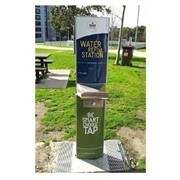 General purpose: Three open drain outputs, one input. 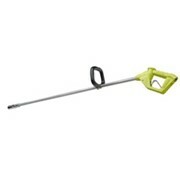 Set points: Three open drain lines. 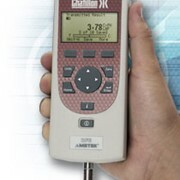 Included items: Carrying case with chisel, cone, V-groove, hook, flat, extension rod, universal voltage AC adapter, battery, quick-start guide, USB cable, resource CD (USB driver, MESUR™ Lite software, MESUR™gauge and MESUR™gauge Plus 90-day trial, and user’s guide), and NIST-traceable certificate of calibration with data. Tabulates and plots load vs. time or load vs. travel. Also calculates statistics, exports to Excel, and more. Send test data to a PC, statistical printer, or other data collector for further analysis. Allow for quick grip installation and removal, and prevent grip rotation. 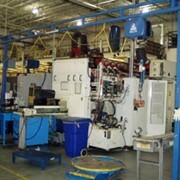 Mount to common test frames, load cells, and force gauges. 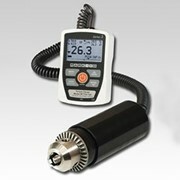 Perform up to 3 consecutive gauge functions with one footswitch activation. 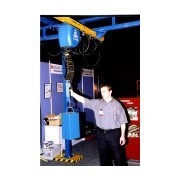 For mounting Mark-10 gauges to a fixture or testing system. Includes mounting hardware. 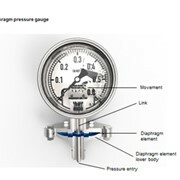 Note: Gauge mounting plates are included with Mark-10 test stands. 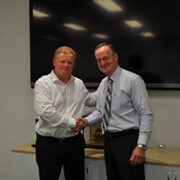 Australia’s leading manufacturer & supplier of testing & measuring instruments, providing quality solutions to customers’ manufacturing process & laboratory testing requirements. 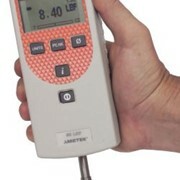 We supply a vast range of testing equipment to multiple industries. Instruments are used to test different aspects required for quality control & cost reduction of a final product, with reference to recognized standards. As an award winning manufacturer, IDM proudly supply quality certified instruments & services to major global companies such as A.H. 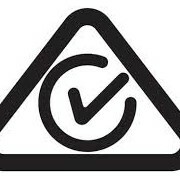 Beard, Amcor, Ansell, Australian Paper, BASF, Carter Holt Harvey, Dow, Dunlop Foams, Fenner Dunlop, Hoerbiger, Holden, Johnson Controls, Kimberley Clark, Kraft Foods, Multiflex, Original Mattress Co., RMIT, Shell, SITRA, Sleepy Head, Tempur, Toyota, Visy Industries …. & many other global giants. We also do in-house CNC machining and fabrication on our state-of-the-art equipment, operated by our highly skilled technicians, for turning all ideas and designs into tangible products. Mention IndustrySearch so IDM Instruments can best assist you! 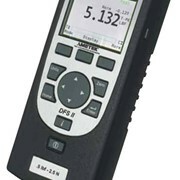 Get a callback from an expert at IDM Instruments to help answer your questions.